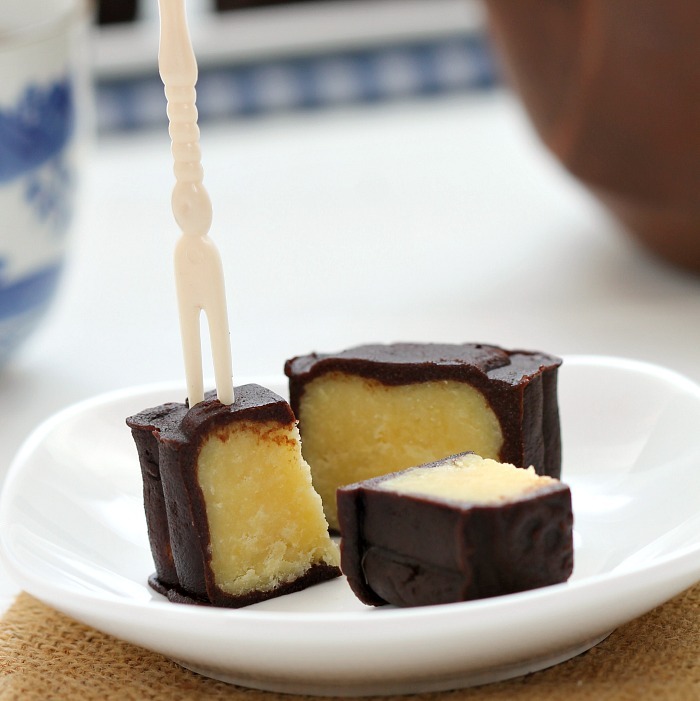 my bare cupboard: Chocolate snowy mooncake "
So , I tried my hand on baking this Mid-Autumn must-have , mooncake . Mid-Autumn Festival is considered to be one of the most important events for the Chinese people . It is a harvest festival that dates back thousands of years ago . Here in Hongkong , it's the time for family reunion , some kids totting their favorite cartoon character-shaped lanterns , moon gazing at the park and of course , giving , receiving and eating mooncakes . I was planning to buy the filling , baking supplies shops here have some amazing array of fillings but settled on making it . I used Christine's Recipes' mung bean filling recipe since I love the taste of one of Taipan's snowy mooncake with that kind of filling . It was simple but time consuming to make and since I got lazy while making it , I skipped one important part , pushing the cooked mung beans through a sieve , so instead of smooth pureé , mine came out with a bit bumpy texture . Oh , I also reduced the liquid way too much , the result was a tad dry and crumbly filling but workable nonetheless . Luckily , it still tastes great , the sweetness is just enough and will try it again maybe , next year . And no skipping this time ! I commented on Jeannie's blog before that I want to try Vicky's mochi mooncake , the skin only , and she said that making mochi is sticky and I got a cold feet the night before my first attempt hee hee ! So , I used the recipe that I found before at Edith's old blog , Precious Moments . The recipe is really simple to make , the dough is very easy to handle and the flavor is absolutely gorgeous ! If you're looking for one delicious snow skin , you must try this one ! * Rinse mung beans and soak at least 4 hours or preferably , overnight . Transfer beans into a large shallow pan , cover beans with 1 cm of water and steam in a wok over medium-high heat for 20-25 minutes or until it's easily smashed with your fingertips . * Drain beans in a sieve and discard excess liquid . Use a large spoon to press the cooked beans through the sieve and you'll get a smooth mung bean pureé . * Transfer the pureé into a nonstick pan , add sugar , coconut , milk , oil and salt , mix well . Cook over medium-high heat until liquid is reduced by about two thirds . Sift in starch , in 2 addition , stirring well after each . * Reduce heat to low and cook , stirring constantly , for about 30-35 minutes . Transfer mixture into a bowl and let cool completely before using . * In a small saucepan , combine water and sugar ; over medium heat , cook until sugar is melted . Take pan off heat , stir in the cocoa powder and paste , use a whisk and mix well . Add in the melted chocolate and stir well to combine . * Combine flour and shortening , mix thoroughly . Add it to the chocolate mixture and mix to form a dough then chill in the fridge for 30 minutes before using . You can chill the skin overnight . * Weigh filling and skin into portions , form into small balls . Put adequate amount of extra cocoa powder into the plate . Dust the mould lightly with cocoa powder . Line a baking sheet with silicone mat . * Roll one portion of chocolate skin between a sheet of plastic wrap , use a rolling pin or fingers to flatten it , about 1/8 cm thick ( rough estimate ) , dust your hands with cocoa powder and put skin into your palm , wrap in the filling . Place into the mould , press firmly on top of the lined baking sheet and release . Repeat with the rest until skin is all used up . 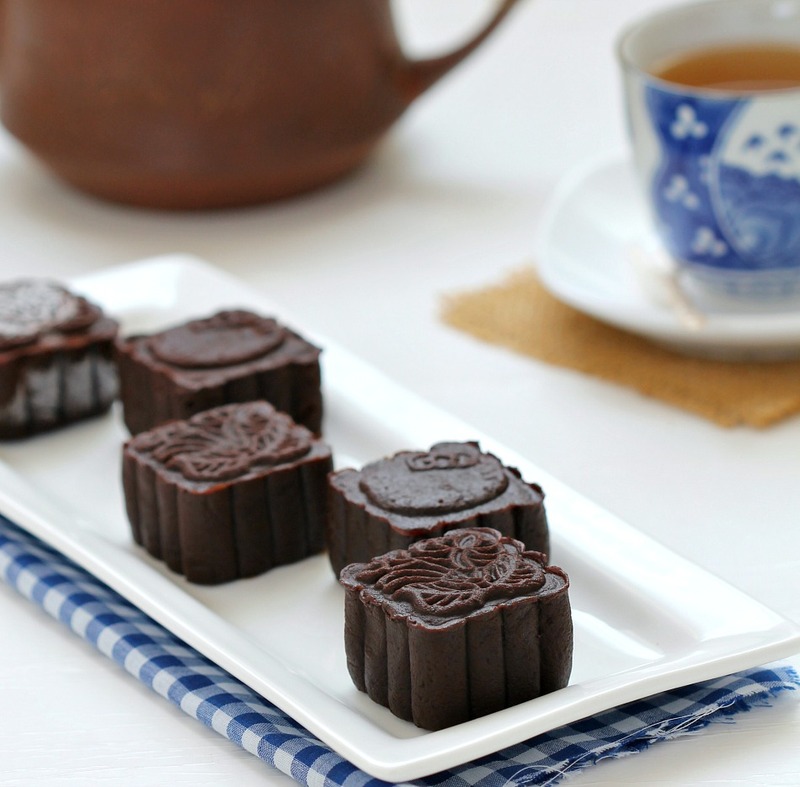 * Chill in the fridge for at least 4 hours before eating or freeze mooncakes and thaw them in the fridge beforehand or at room temperature for 20-30 minutes . Anne, Like your dark chocolate snowskin moonckaes. Look pretty! Mine was too light, should have mix with some cocoa powder. They are so pretty and I love the colour contrast between dark skin and light bean filling. Excellent! 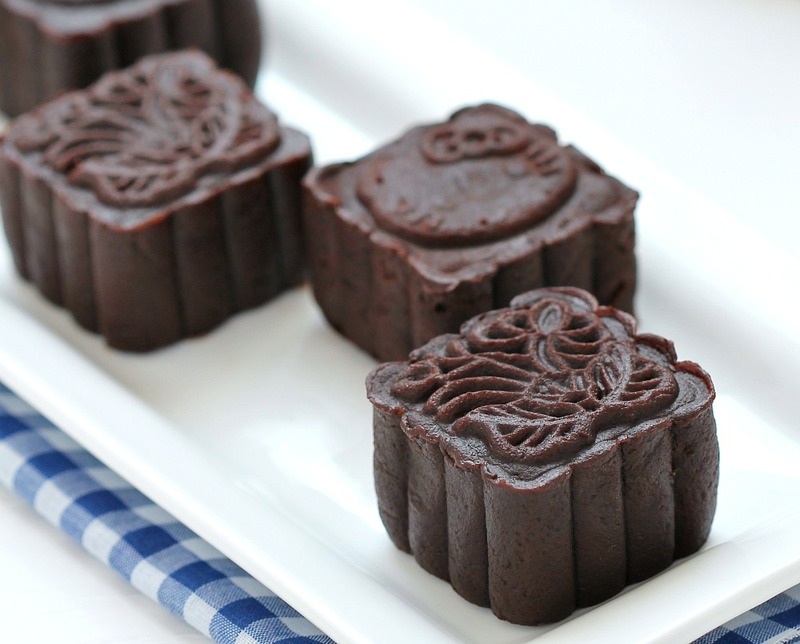 *clap clap* on your first homemade mooncakes! yeah, the flower one looks pretty, good work! Anne, I have never seen chocolate moon cake here. they look so cute!